The Tunable Counterpoise plugs directly into the Wide-Bander or can be attached to a rig chassus if a wire antenna is being used. Works as an "artificial earth" when used with the Wonder-Wand and any other portable QRP antennas. 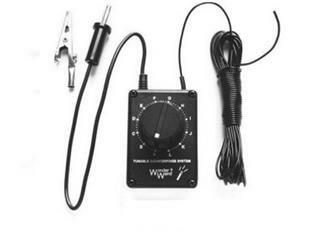 Simply extend wire, connect to the chassis of your transceiver or Wonder-Wand ground socket then rotate the knob until the signal improves!